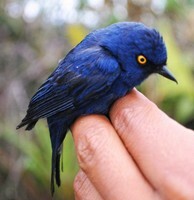 The deep-blue flowerpiercer of the Andean mountains has shifted to higher elevations in recent years. Image courtesy German Forero-Medin et al. Birds’ ranges appear to be shifting in response to the changing climate. However, as we note in Winged Sentinels, tropical birds could face special constraints in their ability to track climate change in this way. A new study in PLoS ONE sheds light on the response of tropical mountain birds. As the climate changes, bird populations may be expected to track their climate niches, tracking (roughly-speaking) toward to poles or upward in elevation. But in the tropics temperature changes relatively little with latitude, implying that birds may rely to a greater extent on their ability to shift to higher ground if they are to keep up with climate change. As the first study to evaluate the effects of warming on the elevation ranges of tropical birds, the new research shows that although tropical birds in Central Peru are shifting upslope, they are not keeping up with warming. This rare glimpse into tropical birds’ response to warming is possible because German Forero-Medina of Duke University and his colleagues were able to compare data on birds in remote Cerros del Sira with observations made there by John Terborgh in 1969. Luckily, Terborgh had collected information on the elevational limits of the same bird species across different peaks of the Cerros. He found that these limits varied from peak to peak, implying that the birds’ range margins were unlikely to be a simple response to temperature. Interestingly, and despite this complexity, Forero-Medina’s study reveals that the birds showed remarkably consistent upward range shifts across four decades of warming — but at a slower rate than the change in climate. This lag, they theorise, may indicate that these tropical birds are tracking the responses of trees, which have been shown in South Eastern Peru to migrate at just 45% the rate one would predict from warming in that region. The danger for birds is that if they move to higher elevations to keep cool, they may run out of suitable habitat; as for those that do not shift upslope, it will be important to understand if and how climate warming could exceed their tolerances. Climate Change Driving Tropical Birds to Higher Elevations (2011) Duke University web article.